And, oh yes, you pick—blindly and with miraculous good luck—a book off the shelf by one Kenneth Rexroth called Natural Numbers. All these years later—forty-seven to be precise—I still have that book, published in 1963 by New Directions and costing, new, $1.75. I sat there all evening, drenched, I am sure, in the smell of stale hot pies, reading the book from cover to cover. Then, reluctantly ($1.75 was a lot of money), I bought the book, drove my old Buick to the nearest streetlight and sat in the car reading it again. Here was a man (and it was important that he was a man in my case, someone who had a clear sense of the vagaries of the male heart) who understood absolutely everything I was going through; a man who was not afraid of passion and passion's first cousin, love; a man who was not afraid of political anger (his poem about discovering the Chicago stockyards at age nineteen--exactly my age—stays with me still). Here was a man who gloried in travel, in dislocation. And most of all: here was a man whose life had been transformed by two things above all: nature and poetry. Perhaps the most well-known poem from that book of new and selected poems is "The Signature of All Things," written in 1946, soon after the end of World War II. It is a poem in three sections, a total of some eighty lines, each written in seven or eight syllables, with no regular meter (he turns most often to iambic tetrameter when especially moved). The poem is triggered by the speaker’s reading the mystic Jacob Boehme's book, "Signature of All Things". Boehme was the seventeenth-century German mystic who believed in something he called "the law of signatures," a concept that suggested that every object in the real world has a hidden meaning.
. . . The long hours go by. These were, it turns out, exactly the words I needed to hear: if you opened yourself to the natural world it might be possible to let go of your own "sin and trouble," and even of the world's evil (if only for the space of a July day), and connect to a much larger world, a world that still contains life and death, loss of love as well as its pleasures, but a world in which you are not, mercifully, at the center of things and your own small triumphs and failures move discreetly into the background. This was the promise of the natural world as Rexroth described it, but even more important, this was the promise of poetry: to read it and to write it could serve as a bridge that would lead to a kind of eternity, an eternity whose "signature" is our very own world, the one which swirls around us. And forty-seven years later, still am. 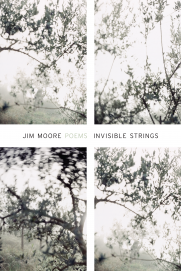 Reviewing Invisible Strings for The New York Times, Dana Jennings wrote “Jim Moore’s poems are an artful amalgam of humor and fierce attention, suffused by a passion for ancient Asian poetry. Like his sage poet-teachers he grasps the quiet power of white space, knowing that what is unsaid is often just as crucial as what is.” Michael Klein in The Rumpus detected a Boehme-like quality: “Moore can write tantalizingly about the hidden code of the domestic ritual.” Moore has received numerous awards and fellowships from the Bush Foundation, The Loft, the McKnight Foundation, and the Minnesota State Arts Board. He teaches at Hamline University in Saint Paul, Minnesota, and at The Colorado College in Colorado Springs, as well as online through the University of Minnesota Split Rock Arts Program.